I went to Main Street because I thought the Dapper Dans had a set coming up, but I think that the entertainment schedule I had was actually the one for the previous week or I had simply missread it, but by the time I figured that out it wasn't all that long until the Family Fun Day Parade would be forming up so I stuck around for that. 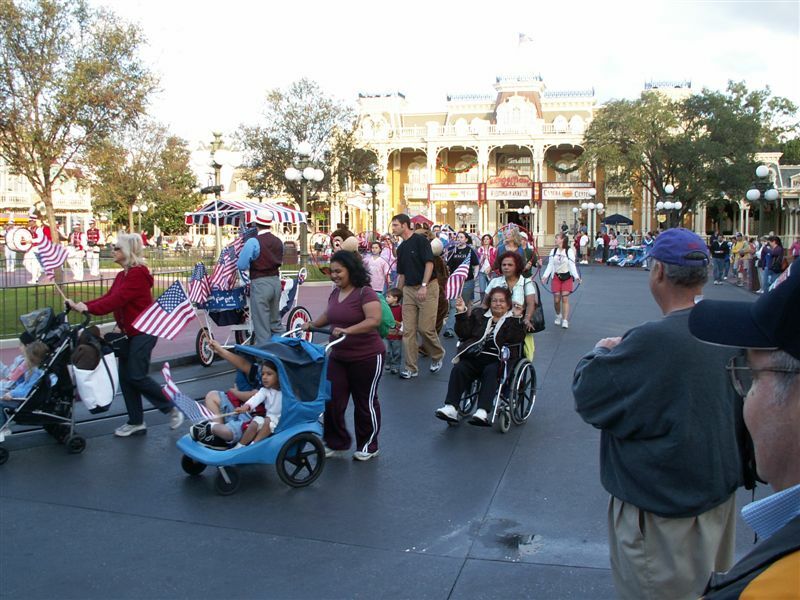 This was my first time watching this parade, and it can be a little puzzling when you first see it, but after it was all said and done, I think I "got" it, not only that I think I even like it. 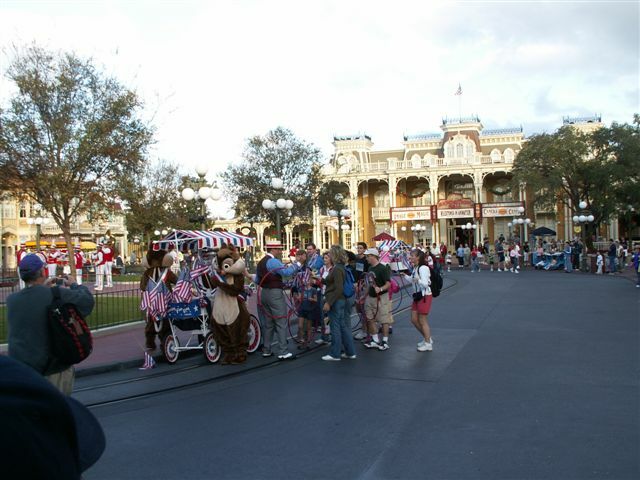 Before the parade starts an announcer mentions it's getting ready to start and families who want to join the parade should go to the hub. I viewed it from Town square, but it's not too hard to figure out that the parade forms up at the central plaza, they tell the guests their parts then the parade starts, I wish I had taken at least a few photos of the parade coming down the straight part of Main because once they get to Town Square the band goes to the center of the square, I'm guessing that they probably lead the parade from the Plaza. 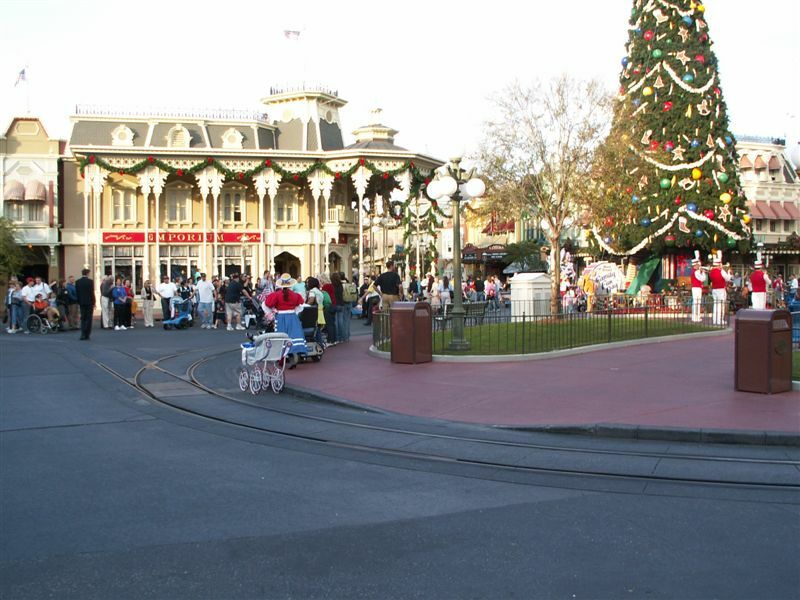 Around the hub two or three CMs are chasing all the members of the public back up onto the sidewalks, you see they don't put up ropes along Main Street for this parade like they do the regular parade, this is a smaller scale show more akin to the trolley show, it's less like a big Disney extravaganza parade, and more like the smaller type of a parade an "idealized" turn of the 20th century town might have thrown. 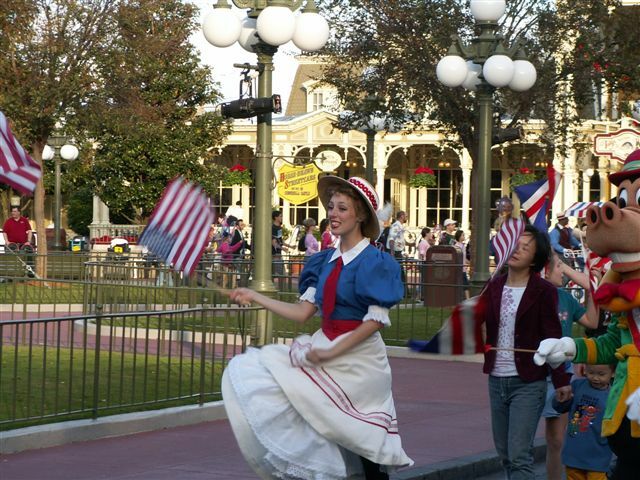 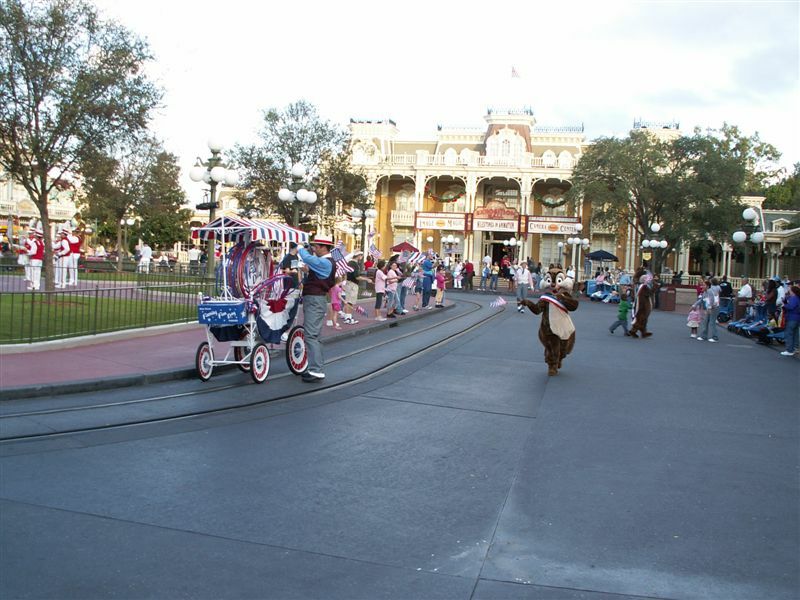 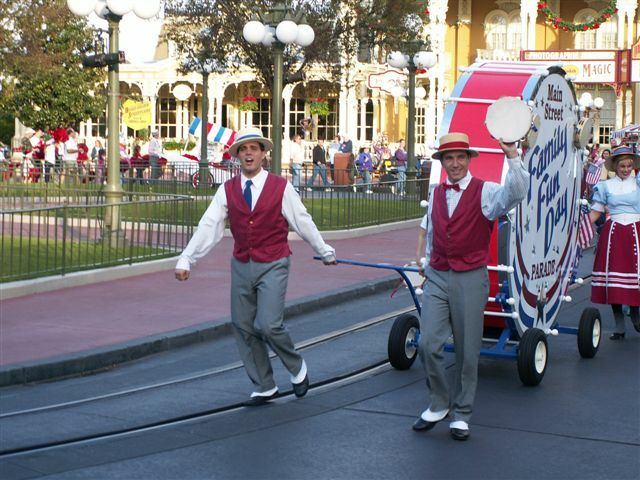 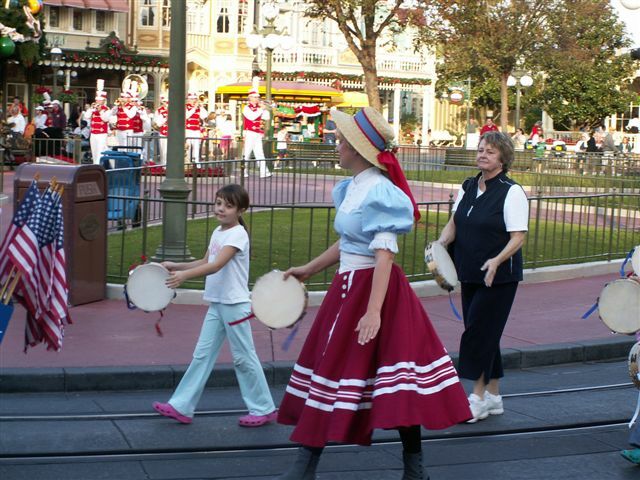 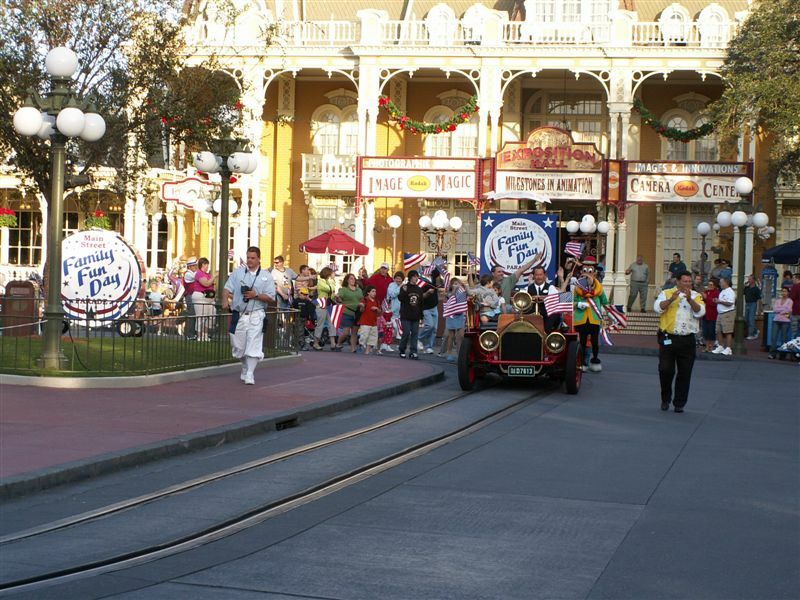 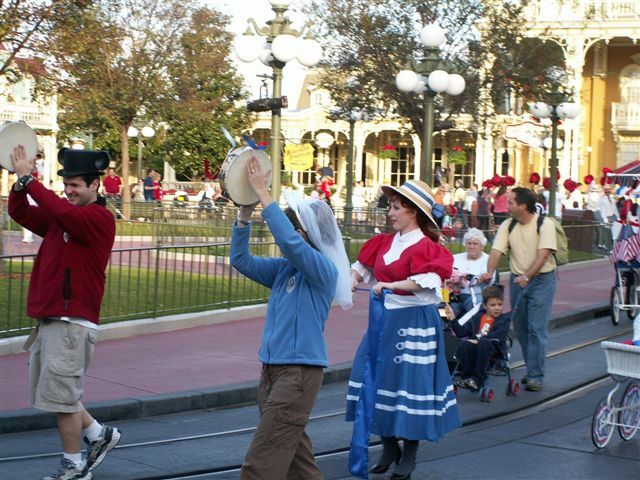 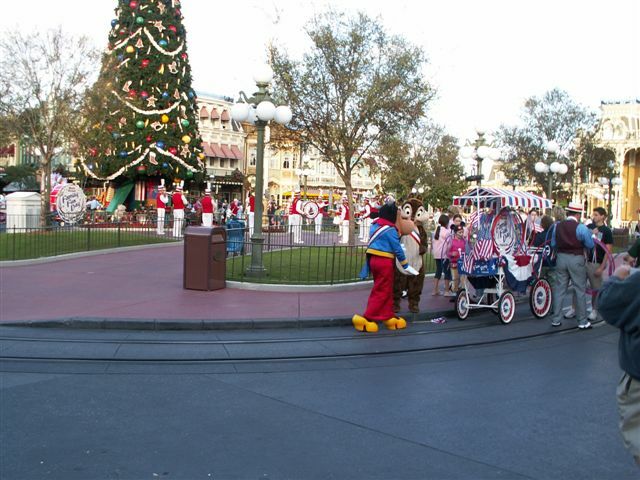 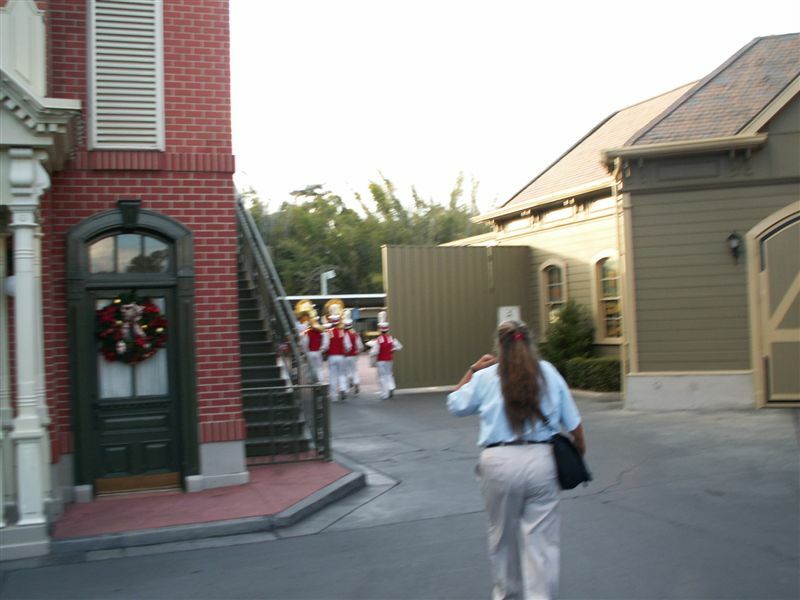 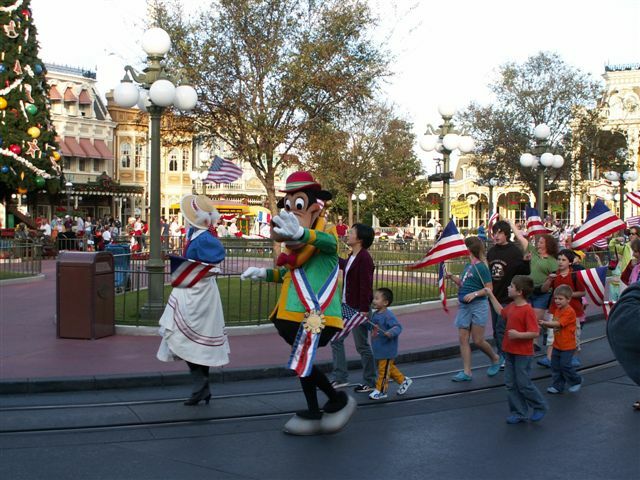 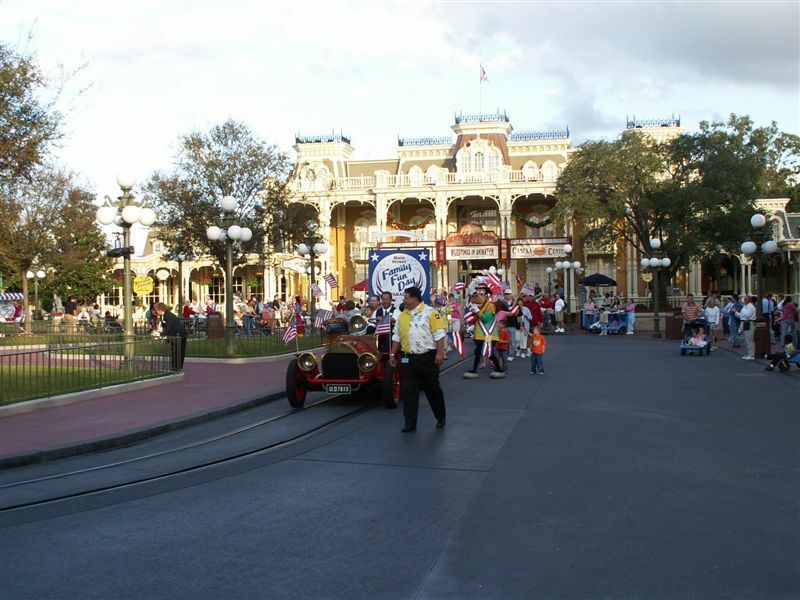 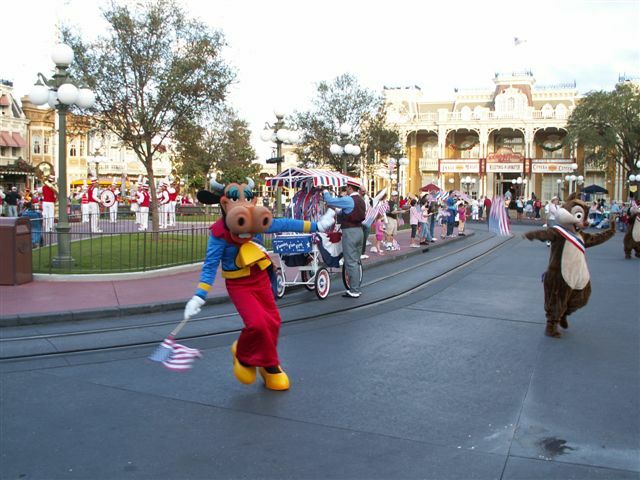 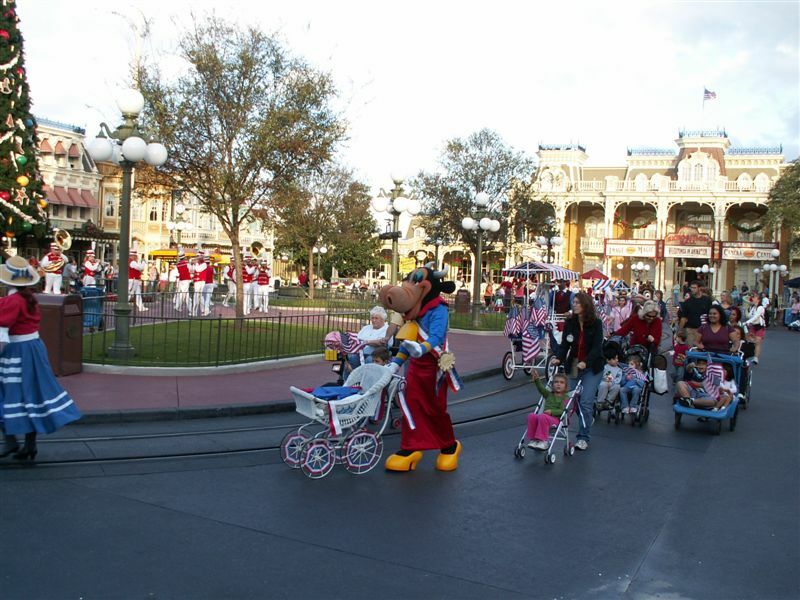 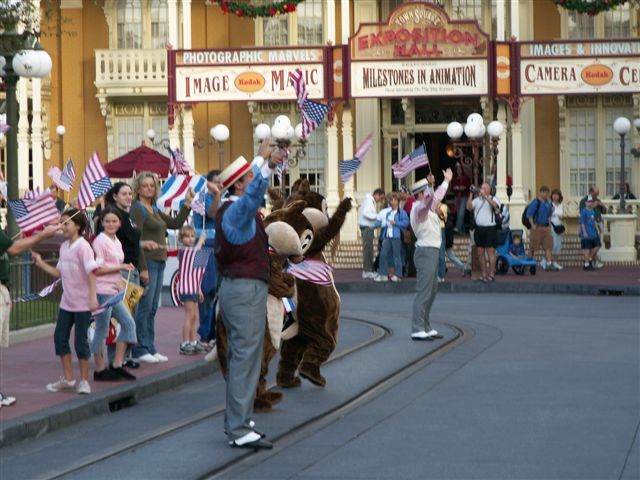 Still this threw me a little bit especially, well before the parade arrived, when one CM was trying to clear all of Town square streets (and the central square) almost single handedly, once the parade arrived quite a few more cast members appeared and it stopped seeming so ridiculous. 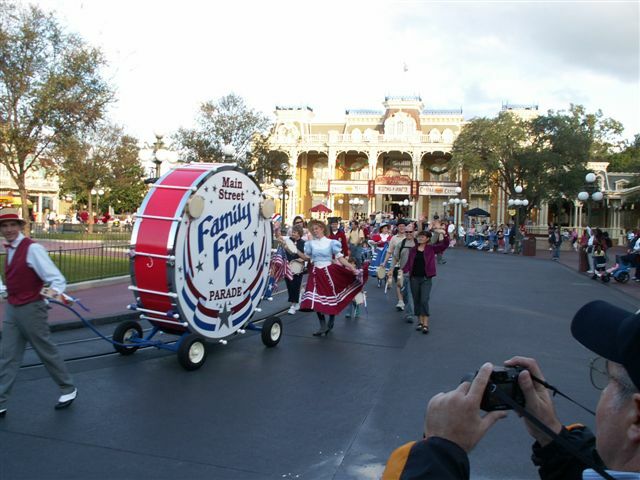 My guess is a few folks may have just been late to their marks this day. Now when I say this parade is one that one like an "idealized" turn of the 20th century town might have thrown, what I mean is the things in the parade are all things that would have been available to the town, a band a fire engine, a few pretty ladies and young gentlemen in vests and hats, and a cow, horse and some chipmunks...ok so the cow and horse are wearing clothes and the chipmunks are over 5 feet tall, but like I said it's an idealized turn of the century town, and in an ideal world wouldn't Clarabelle Cow, Horace Horsecollar and Chip and Dale all participate in a Star Spangled, Flag Waving Parade? 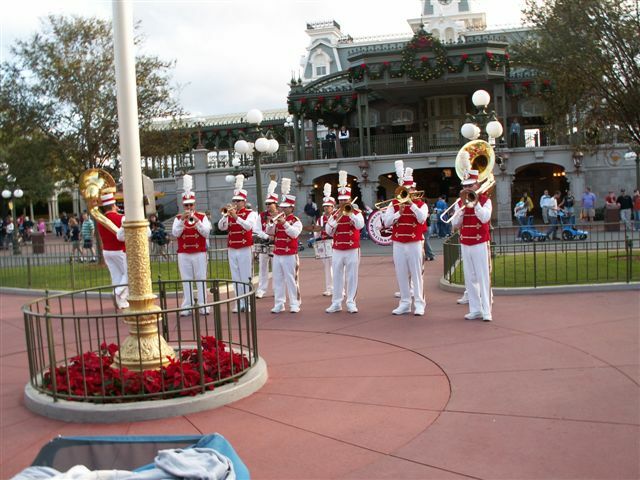 As the Band is coming Down Main Street 76 Trombones is being played, both by the band, and over the loudspeakers, once the Main Street Philharmonic sets up in town Square Strike up the Band plays, still the audio comes over the loudspeakers and part of this is to provide the vocal accompaniment, yes they could just play the vocals, but if they did that it would stick out like a sore thumb, so in my opinion the reason the loudspeakers play so much of the music that the band could play solo is so that the vocals of both Strike up the Band and the flag waving finale of You're A Grand Old Flag will fit right in to make the whole picture they are trying to paint, which is basically small town America of the early 20th century on Independence Day. 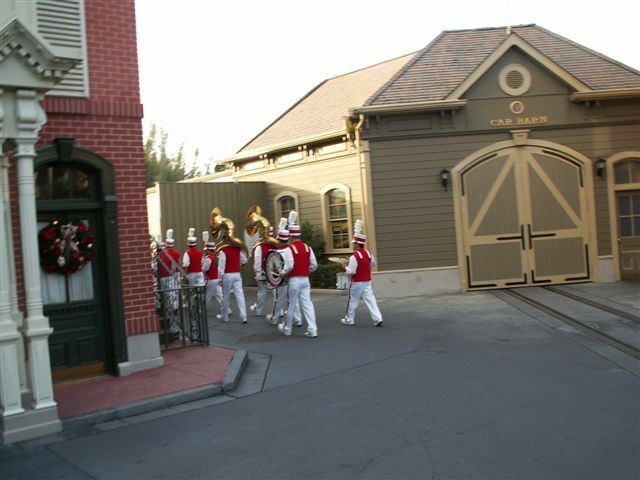 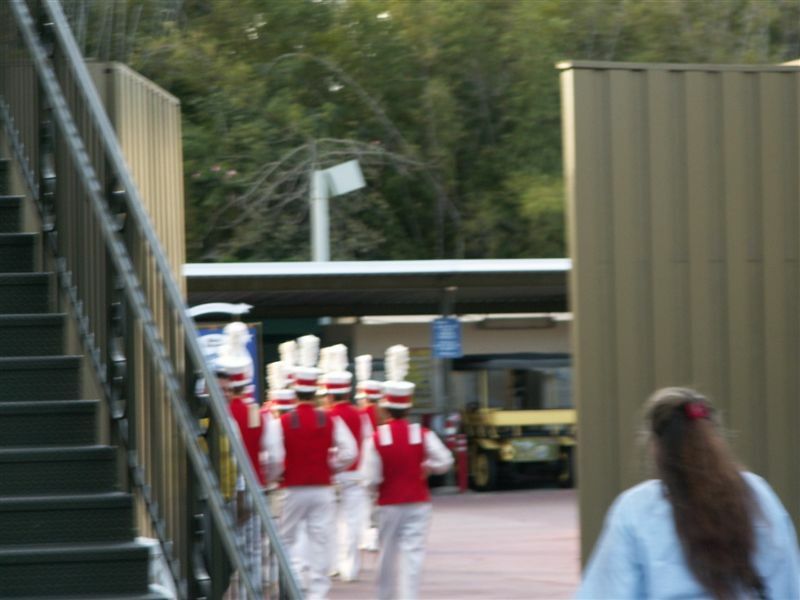 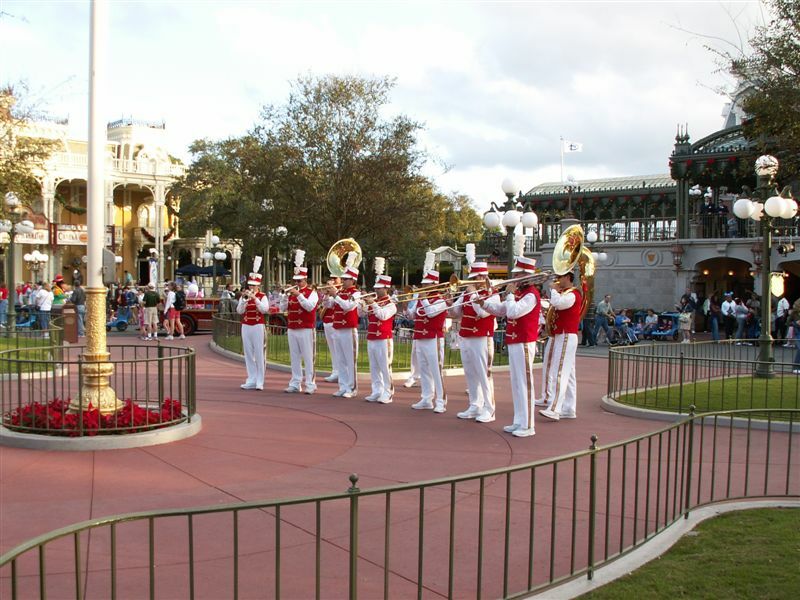 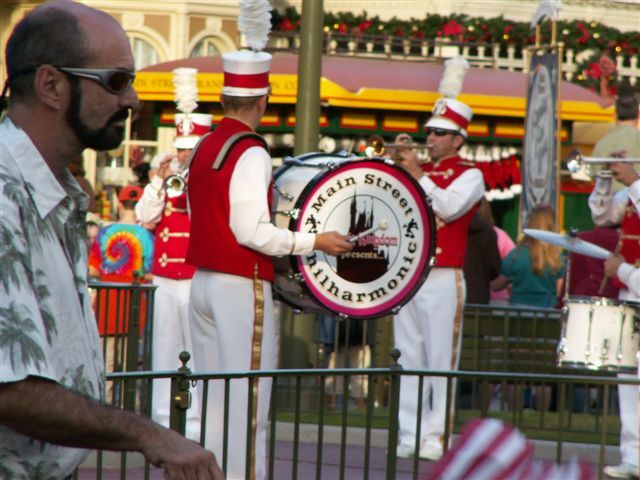 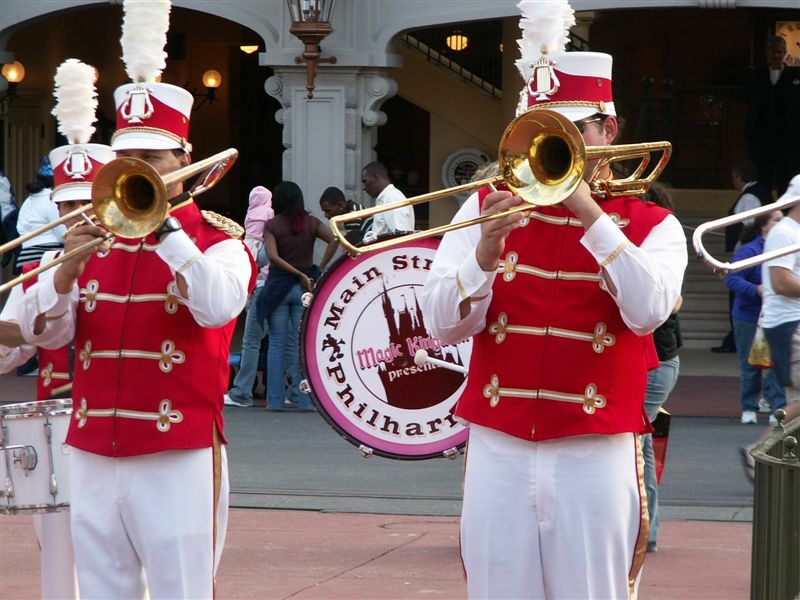 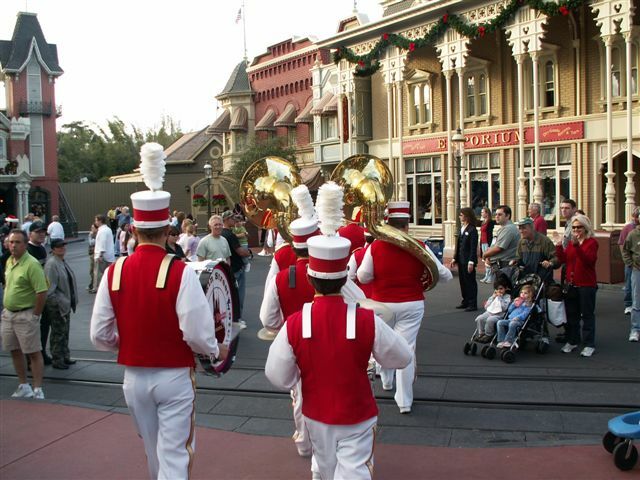 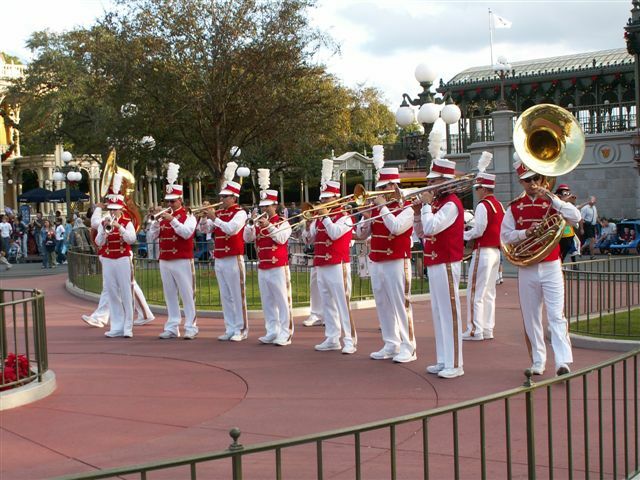 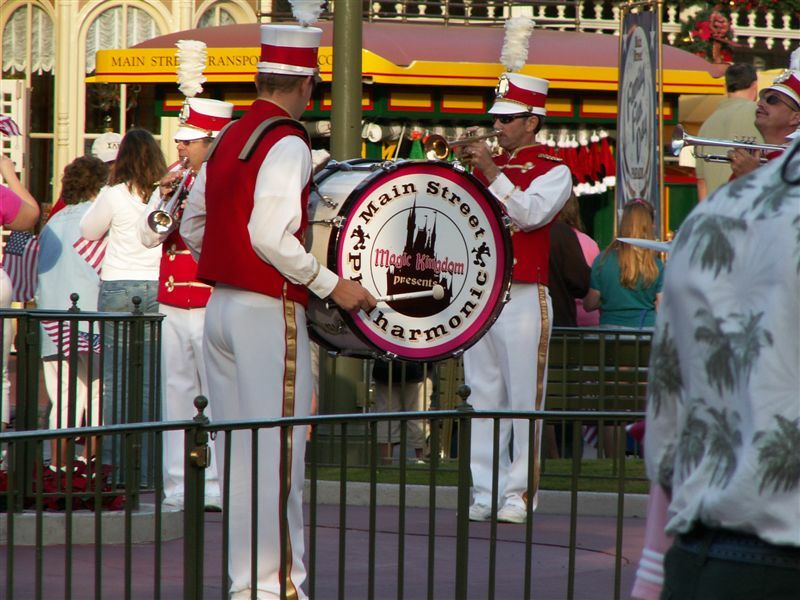 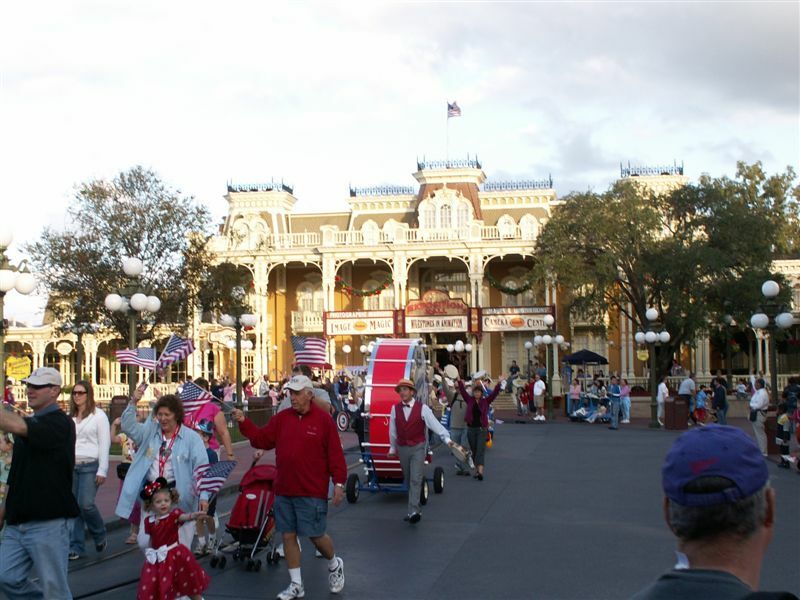 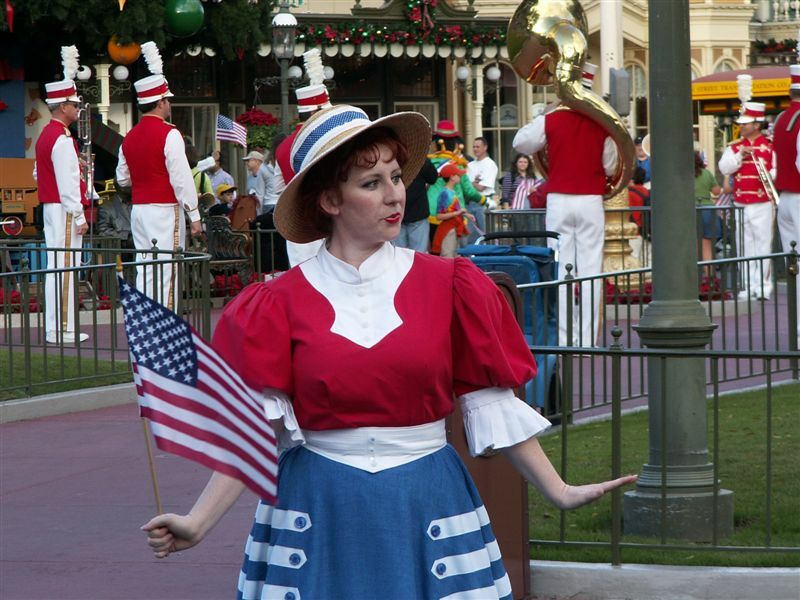 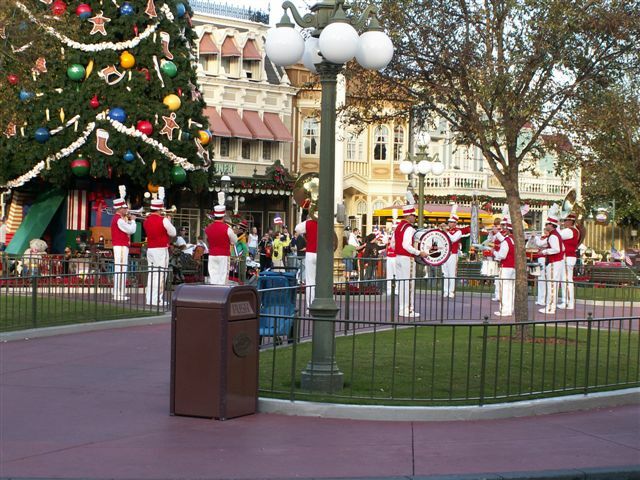 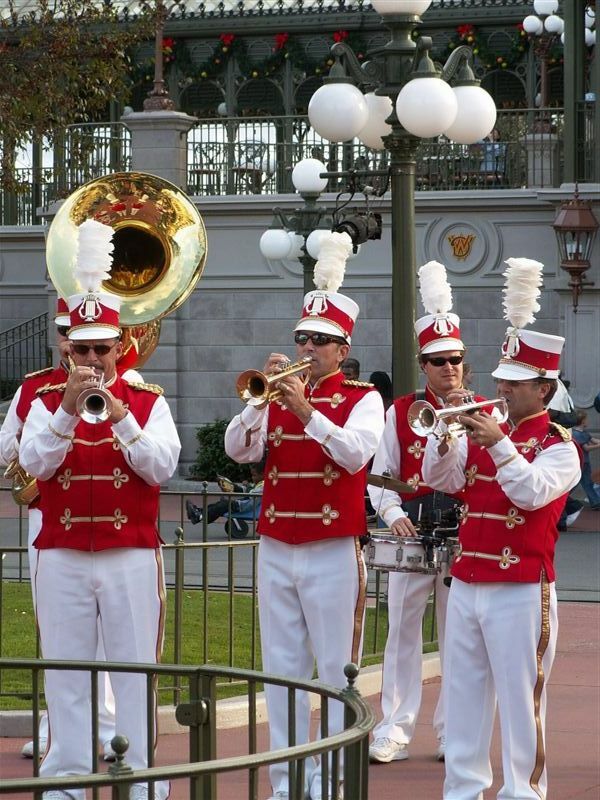 Once the parade portion finishes the band remains in Town square and plays a few more songs (finally letting the guests get in close) before they finish up and march off-stage.